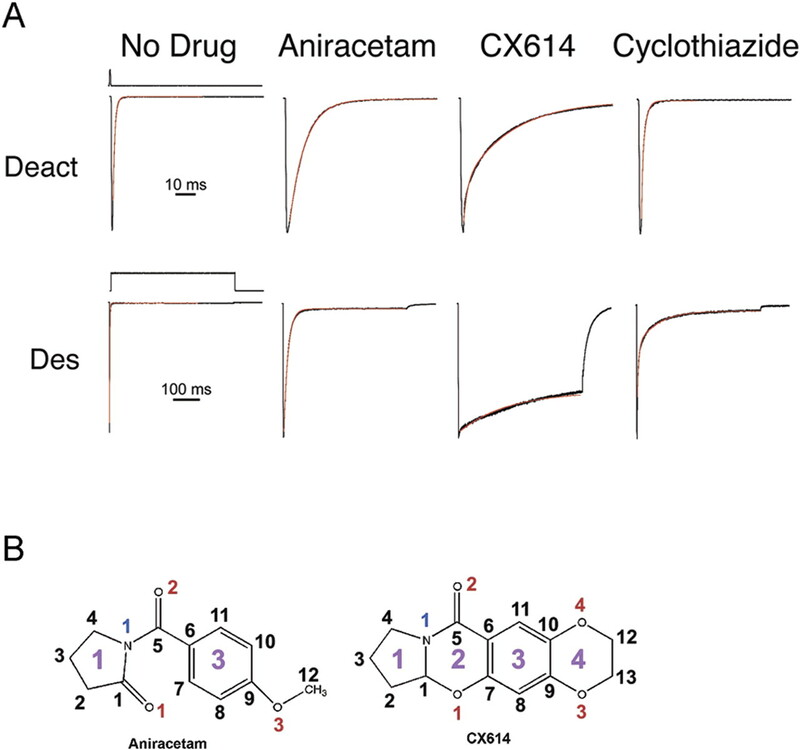 The positive allosteric modulators aniracetam and CX614 slow deactivation more profoundly than cyclothiazide at GluR2 (flop) receptors. A, Electrophysiological responses of GluR2 (flop) expressed on outside-out patches of transiently transfected HEK 293 cells. Top traces show the kinetics of deactivation, the decay of the peak response after a brief (1 ms) pulse of 3 mm quisqualate. Bottom traces show the kinetics of desensitization, the decay during a prolonged (500 ms) pulse of quisqualate. Responses are shown for patches with no drug or with 5 mm aniracetam, 100 μm CX614, or 100 μm cyclothiazide. Single-exponential fits are superimposed on the trace. Open-tip potentials are shown above the control traces. 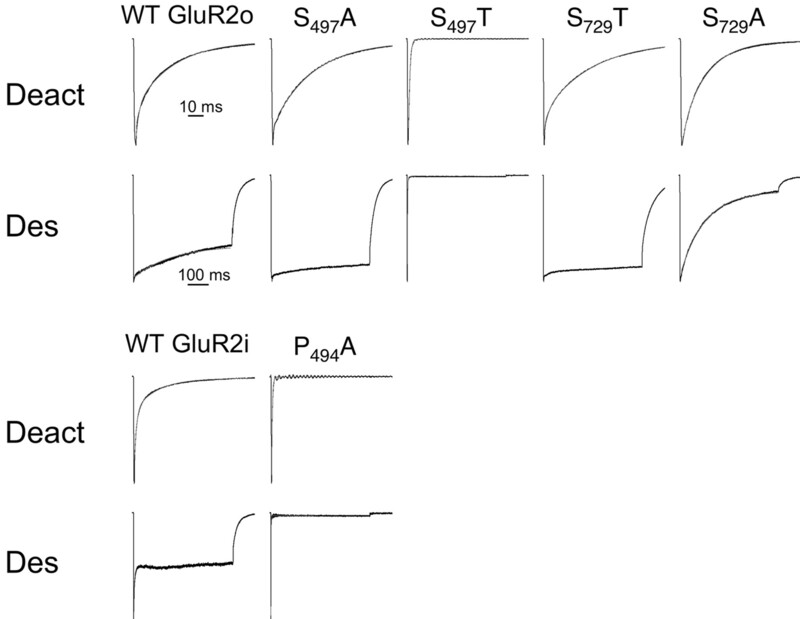 Note that desensitization by CTZ of GluR2o is only partially modulated compared with the flip isoform in which desensitization is virtually blocked. B, Chemical structures of aniracetam and CX614. The atoms of aniracetam and CX614 are numbered using smaller font, with oxygen atoms in red and carbon atoms in black, and the rings are numbered using a larger font. Omit electron density maps calculated using |Fo| – |Fc| coefficients for aniracetam and CX614. A, Electron density for aniracetam contoured at 2.5σ. B, Electron density for CX614, also contoured at 2.5σ. For each modulator, the fit of the molecular structure to the electron density is shown for each of the twofold related positions of the modulator; on the top rows, the views are perpendicular to molecular twofold axis, whereas in the bottom rows, the views are parallel to the molecular twofold axis. Aniracetam and CX614 bind in the dimer interface, in a crevice at the clamshell hinge. A, View down the twofold axis, showing the binding of aniracetam, in one of its two equivalent orientations. Protomer A is in green, protomer B is in blue, and aniracetam is drawn in Corey, Pauling, and Koltun (CPK) representation, as is the partial agonist fluorowillardiine. B, View of the Ani/FW complex perpendicular to the molecular twofold axis. Here, aniracetam is red and in CPK representation; the approximate positions of the “linker” that connects the ligand-binding cores to the transmembrane domains is shown. C, View of the CX614 complex, along the molecular twofold axis, with the protein subunits colored as in A and CX614 and quisqualate in CPK representation. D, Illustration of CX614 binding pocket using the same view as in C, with CX614 in red. Hydrogen bonding interactions and binding modes of aniracetam and CX614. A, Top view of hydrogen bonding (dashed lines) between aniracetam, protein residues, and water molecules (blue spheres), in which the domains are color coded as shown in F. B, Side view of aniracetam hydrogen bonding interactions. C, View of hydrogen bonding interactions between CX614, protein, and water molecules from the top. D, CX614 interactions with protein and water molecules from the side. E, Binding of CX614 illustrated using CPK representation, showing residues Pro 494, Ser 497, and Ser 729 from each subunit, illustrating how the prolines form the “top” of the binding pocket and the serines form the base. F, A simple model to describe the mechanism of action of positive allosteric modulators such as aniracetam and CX614 on AMPA receptors. 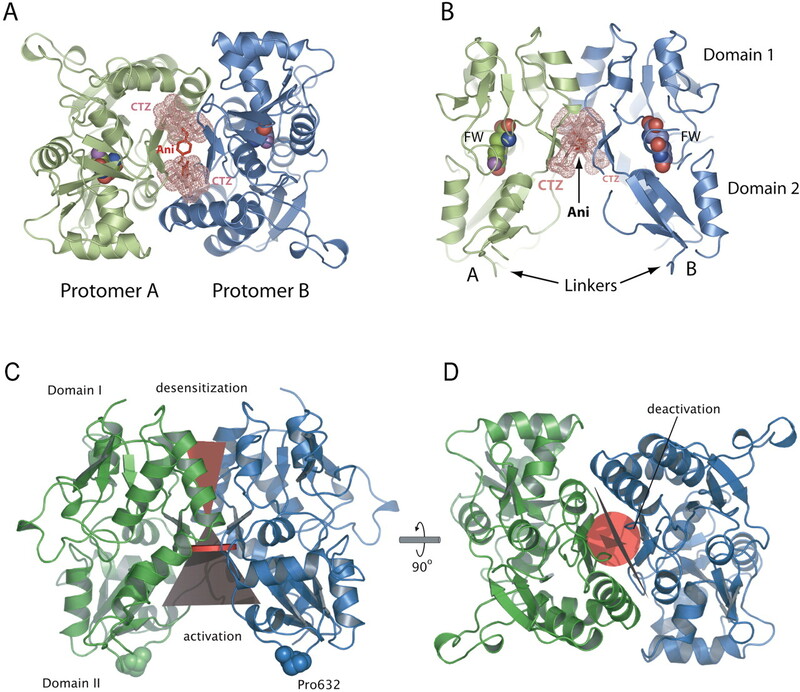 The diagram depicts a side view of the GluR2 ligand-binding core dimer in which domains 1 and 2 of protomer A are orange and blue, and domains 1 and 2 of protomer B are red and green, respectively. Agonists are represented by small blue spheres that bind between domains 1 and 2 and stabilize the closed-cleft conformation. Modulators, such as aniracetam and CX614 (yellow oval), bind on the backside of the ligand-binding core through interactions with a proline ceiling and a serine floor, at the interdomain hinge in the dimer interface, and stabilize the closed-cleft conformation of the ligand-binding core (dashed lines). The binding sites of aniracetam and CX614 overlap. A, View parallel to the twofold axis showing that aniracetam (green) and CX614 (pink) overlap. In fact, rings 1 and 3 are nearly superimposable. B, View perpendicular to the twofold axis, showing that the modulators bind at the same “depth” in the dimer interface. 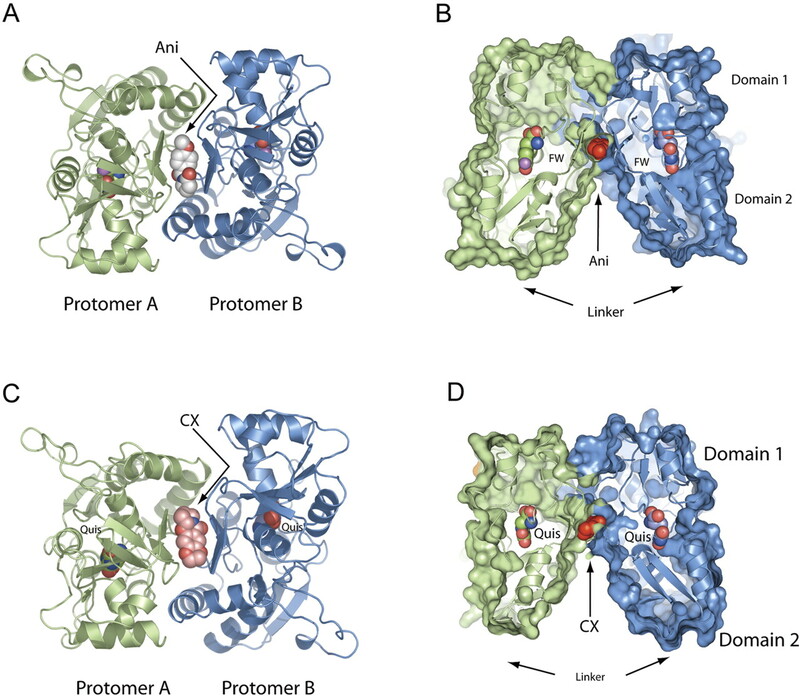 Mutations in modulator binding crevice impair modulation by CX614. Current responses, measured in outside-out patches of transiently transfected HEK 293 cells, of wild-type (WT) GluR2 (flop), and point mutations of residues that interact with CX614 are shown. 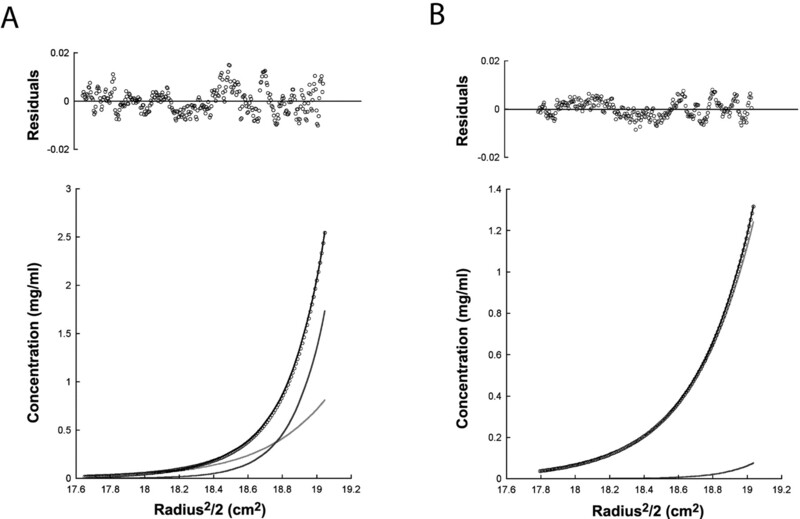 Top traces show impairment of modulation of deactivation (Deact) by 100 μm CX614 with 3 mm quisqualate; bottom traces show impairment of modulation of desensitization (Des). The P494A mutation was measured in a GluR2 (flip) receptor, because the concomitant mutation in GluR2 (flop) was nonfunctional. Conformational changes in the modulator binding site during agonist binding and clamshell closure. A, Shown here are α-carbon traces of the dimers from the Ani/FW complex and the apo state (Armstrong and Gouaux, 2000), in which the domain 1 from protomer B was superposed. In the boxed region, aniracetam is drawn, as are the side chain atoms for Pro 494 and Ser 497.B, Closeup view of the boxed region from A. The Ani/FW structure is blue, and the apo structure is gray. During agonist and modulator binding, the main chain atoms of residues Pro 494–Ser 497 move ∼1.5 Å into the modulator binding site. Comparison of the binding sites for aniracetam and CTZ. A, View down the twofold axis of the Ani/FW complex, showing aniracetam in red. Superimposed on the Ani/FW complex are the two CTZ molecules, taken from the GluR2 S1S2–CTZ cocrystal structure (Sun et al., 2002), after superposition of the protein structure on the Ani/FW protein structure. The molecular surfaces of the CTZ molecules are drawn as pink dots. B, View perpendicular to the molecular twofold axis. C, View perpendicular to the molecular twofold axis, as in B, relating drug-binding sites to their modes of action. Receptor activation increases the distance between domain II of each subunit (dark gray triangle). Subsequent to activation, channel desensitization occurs through rearrangements of domain I interactions (red triangle); this rearrangement is prevented when CTZ is bound. CX614 binds at the hinges between domains I and II (red circle). Rotating the view by 90° (D) allows a view of the CX614 interaction with the hinges, resulting in modulation of deactivation by stabilizing the closed-clamshell conformation. Sedimentation equilibrium data showing that CX614 and aniracetam stabilize the GluR2 dimer to different extents. A, Sedimentation equilibrium data taken in the presence of 0.3 mm AMPA and 0.3 mm CX614; the data shown here was collected at 27 K rpm and a protein concentration of 1.0 mg/ml. B, Sedimentation equilibrium data measured in the presence of 2 mm glutamate and 5 mm aniracetam. For the data shown here, the rotor speed was also 27 K rpm, and the loading protein concentration was 0.75 mg/ml. In both of the experiments involving CX614 and aniracetam, interference data from three loading protein concentrations and three rotor speeds were fit to a dimer–monomer equilibrium, yielding a protein dimer Kd of 26.1 μm in the case of CX614 and 1.4 mm for aniracetam. InA and B, the top panels show the residuals of the fit of the dimer–monomer model to the measured interference data, and the bottom panels show the measured interference data (open black circles), the fit to the data (solid black line), and the relative predicted concentrations of dimer (dark gray line) and monomer (light gray line). As seen in A, CX614 is much more effective in shifting the dimer–monomer toward dimer than aniracetam. cIn the refinements, there were two aniracetam and two fluorowillardiine molecules in the Ani/FW complex and six CX614 and six quisqualate molecules in the CX614/Quis complex. ↵ a Rwork = (Σ∥Fo| - |Fc∥)/Σ|Fo|, where Fo and Fc denote observed and calculated structure factors, respectively. ↵ b Ten percent of the reflections were set aside for calculation of Rfree. Mean ± SEM data for wild-type (WT) and mutant GluR2 receptors. Three functional parameters were measured in the absence and presence of CX614: the time constant of deactivation (τdeact), the time constant of desensitization (τdes), and the ability of CX614 to block desensitization (Des) during a 500 ms pulse of agonist [% des = (1 — ss/pk)(100)]. For example, mutations that impaired modulation by CX614 (i.e., S497T and S729A) desensitized to a greater extent in the presence of the drug. i, Flop variant was nonfunctional; therefore, flip variant was used. ↵ a Significantly slower than wild-type control kinetics (p ≤ 0.0001). ↵ b Significantly faster than wild-type control kinetics (p ≤ 0.0001). ↵ c Significantly different from wild-type GluR2o kinetics in the presence of CX614. *p ≤ 0.0001; #p ≤ 0.01. ↵ d Control percentage desensitization in the absence of drug is 94 ± 1%. supplemental material - Supplemental data. 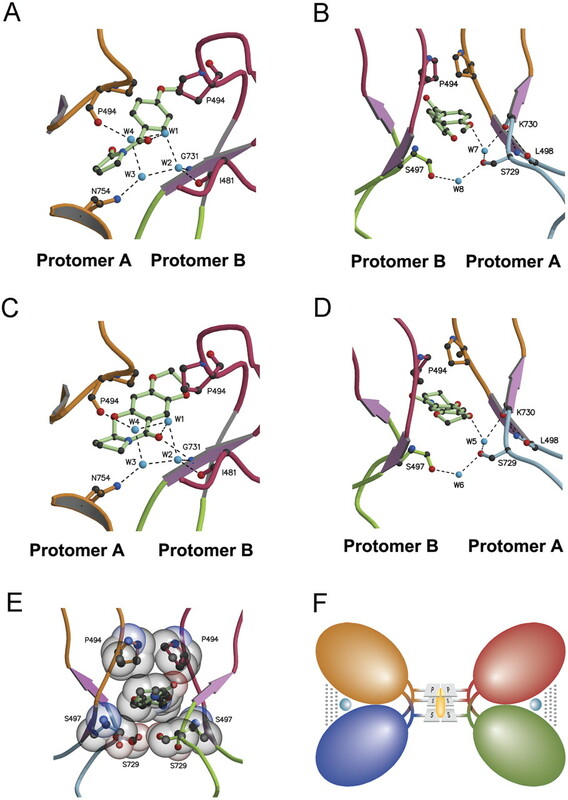 Protein alignment of representative glutamate receptors. A Clustal alignment of the primary amino acid sequence of the ligand-binding core of AMPA, kainate, and NMDA glutamate receptors. Scissors indicate from which regions the isolated ligand-binding core was formed. Domains I (dark blue) and II (light blue) together form the clamshell conformation. The hinge regions (I and II) are shown in red. Point mutations studied are indicated in bold, with their sequence number shown above the alignment. Transmembrane domains are boxed with solid lines; the flip/flop alternative splice site is shown boxed with a broken line.